“Frank Diana works at TCS (Tata Consultancy Services) and he does a great job explaining digital transformation for his clients and the world at large. I have been reading his posts and studying his illustrations (see below for a collection) quite a bit in the past few years; and some of them actually ended up in my own presentations. Like-minded thinkers I guess:) We finally decided to connect for a quick podcast on “reimagining the future” and how we can help our clients to better transform their businesses. We had a lively conversation which will definitely not be the last time I’d predict. GERD LEONHARD: Hello this is Gerd Leonhard, Futurist in Zurich, Switzerland. Today, I’m having a conversation with Frank Diana who works for Tata Consultancy Services, TCS, and he will talk about that in a second. Frank and I have been exchanging e-mails and messages with each other for years now and we’ve become fans of each other’s work. There’s lots of synchronicity between what we do, so we figured we’d have a short podcast conversation today, primarily about the topic of Reimagining the Future, because Frank is also a bit of a futurist. So over to you Frank. Just tell us briefly what you do and how you do it. FRANK DIANA: Well, good morning Gerd. As you said, Frank Diana. I’m with Tata Consultancy Services and I am somewhat of a futurist and advisor. I spend most of my time focused on the next three to five years and beyond and what it might mean for leaders everywhere–not just business, but government, the impact to society and what that might mean for a business. My title actually is Principal, Future of Business, here at TCS. 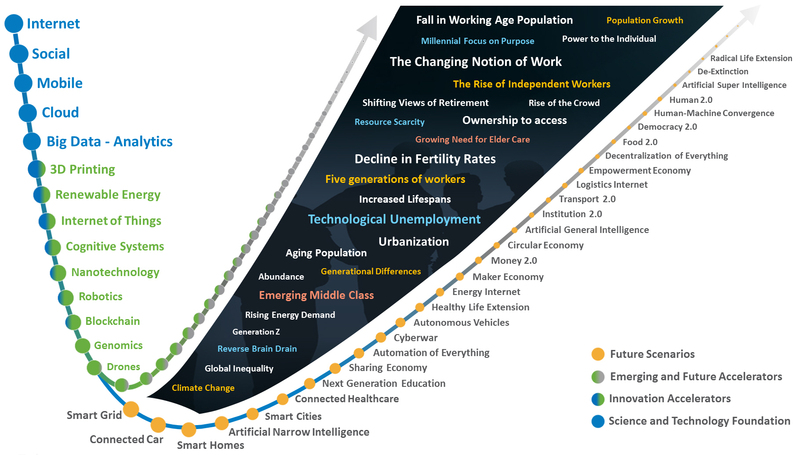 GERD LEONHARD: Well that’s very interesting because the Future of Business is a topic we’ve been talking about for years now. So let’s talk about [it] briefly, because I kind of do the same thing in similar ways. I hold mostly speeches and do sessions. People that listen to this podcast would know what I do, so I’ll talk more about that later. I’m an expert at talking about myself. But let’s go right into the topic of the Future of Business. We actually talk about similar topics quite a bit and one of them is this idea that the future is exponentially different. This sounds like a Silicon Valley meme, but it’s really used quite differently in our world. 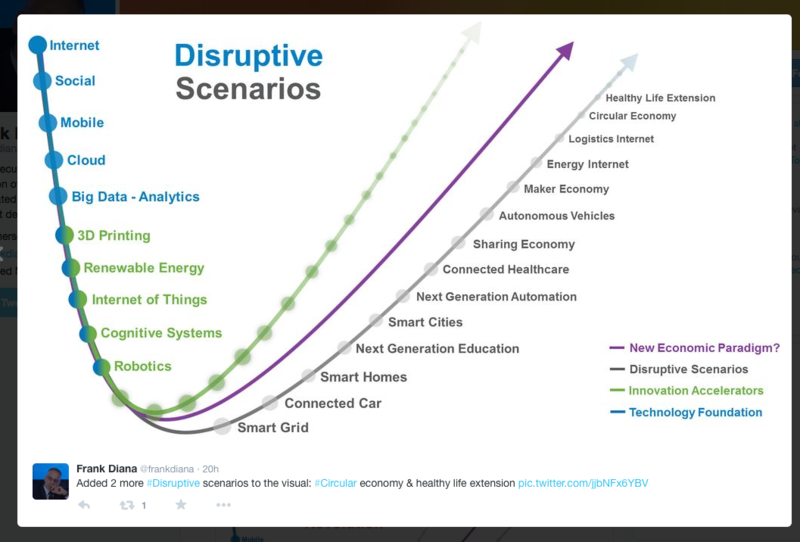 So what do you think about this–the fact that the future is exponentially different. What do you make of that and what’s your key theme there? 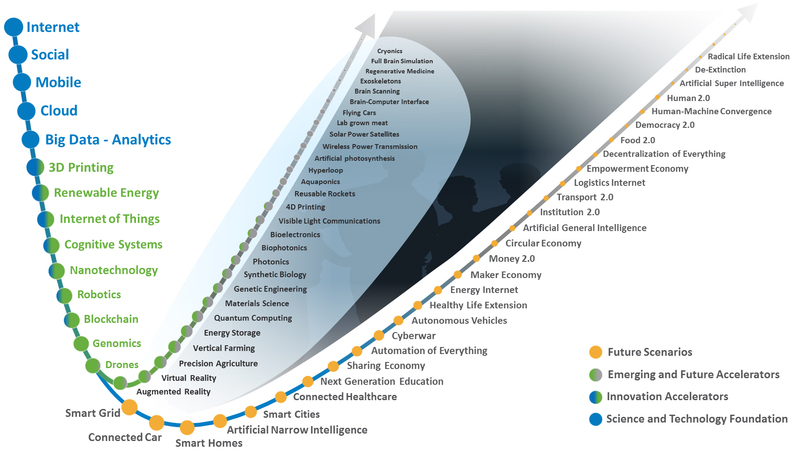 FRANK DIANA: Well, as you and I have spoken before, I think there are two words there–exponential and combinatorial, in that the future is much more fast paced than we’ve ever experienced in the past. One of the underlying or foundational reasons for that, I believe, is that there are so many building blocks in place already. They can be combined in ways that create value fairly rapidly. And so, we’re starting to see innovation exploding, as a result of combinations that smart people are leveraging to create value in so many different ways. I do believe that we’re struggling with linear structures and linear thinking in a world that is much more exponential. 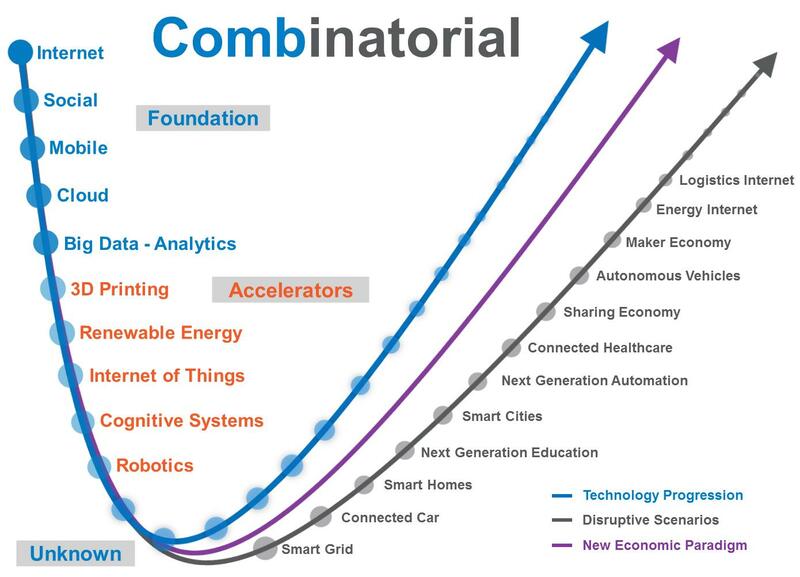 GERD LEONHARD: Well, you know I really love the combinatorial aspect of how you’re describing this. And by the way, to the listeners, if you go to frankdiana.net, you can see Frank’s graphics on this and you definitely have to download those. I think it’s really important to realize that the future is not just exponentially different. We’re now seeing one science breakthrough after the other, but they’re also combining, which is the combinatorial effect, to actually make the world entirely different. They’re amplifying each other. Sometimes I call this interdependence, as well. So for example, smart cities mean smart ports, smart transportation, logistics, a change of vehicles, change of lifestyle, which changes work. So they are all amplifying each other. I use a lot of these in my new book, “Technology versus Humanity”. I use that as the main argument to say that we can no longer expect the future to be observable in some way, like in a linear fashion, because now every eighteen months or so we have major breakthroughs that are literally changing the world. One of them, at CES this year, was the recognition that in the future we’re going to have intelligent digital assistants, rather than websites and apps doing the work for us and replicating how we’re thinking in the cloud, so to speak. I call this the Global Brain and you’ve talked about that Frank, several times, about how interfaces are changing and how technology is actually becoming intelligent now. FRANK DIANA: Yes. Well, first a quick plug for your book. 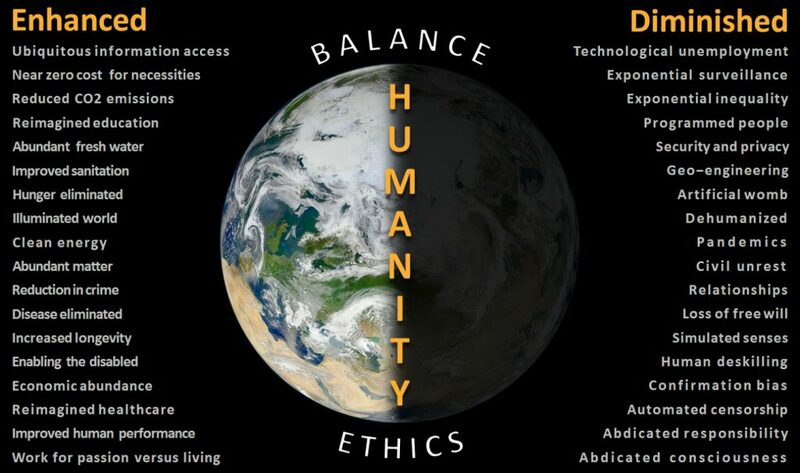 That was a phenomenal book–“Technology Versus Humanity” and hopefully we do speak a little bit about ethics as we go here. Yes, I have really focused on customer experience. It has been a big topic for several years now and I’ve always focused on the next generation of experience. Interaction, and how we interact with one another, has changed and will continue to change. As you consider conversational systems or intelligent systems, as you describe them, or the augmented and virtual reality world we are heading towards, how we interact with one another in society is going to change and has changed considerably. So what does that mean for us going forward? Are those mostly positive effects or are there some unintended consequences from just that? GERD LEONHARD: Yes, interesting point. My view is that technology is inevitable and that these changes are coming, irrespective of whether we appreciate some of them or not. The important thing is going to be some sort of control or balance of technology–the good and the bad side, if a technology has bad sides. For example, the television had a bad effect on communications and creating your own music at home. But still, we have television now and so these technologies, like artificial intelligence, are bound to happen and they are already happening. The question really is–how do we turn them into the most flourishing part for humanity, rather than the scary part that has been depicted in the Hollywood Motion Pictures? So what is your view on that sort of control factor? How will we make sure the technology is going to be used for good or not….